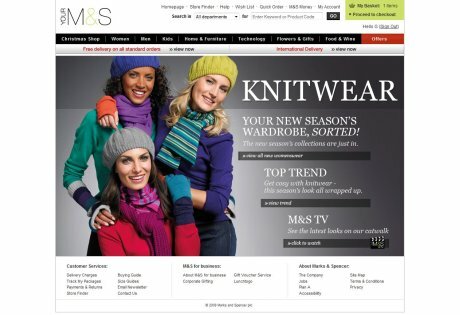 Marks & Spencer launched a revamped version of its website yesterday, the first major update since 2007. The new version improves on this, and looks much better as a result, as well as allowing more space for merchandising, though it still doesn’t fit the whole screen. The page is relatively uncluttered as well, with the knitwear promotion taking up the majority of space, though site search and navigational links are clear. This is clear any easy to use. Users can navigate straight to a category from the top navigation menu, or else choose a sub-category from the drop-down menus. The site search works reasonably well too, and its good that you can search within categories to narrow the scope, though a few searches, such as this one for a red shirt, return a lot of seemingly irrelevant results. Importantly, there are plenty of filtering options for both browsing by category or searching by keyword, which allows users to narrow their product searches. Now that M&S has started adding user reviews, this would be a useful filtering option to add to the site. The product pages are a big improvement, and really benefit from from the widening of the site, as more information can now be included in a prominent position. Product information is good, while the photos, especially for fashion items now have a variety of views, and can be zoomed in more easily. There are some useful little touches too, such as providing product availability when customers select their sizes for clothing. M&S announces on every page that standard delivery is free on all orders, so this question is dealt with neatly, though it doesn’t detail the nominated day delivery option clearly enough. This could be a persuasive sales tool, but it is easily missed. Videos are also available now for a greater range of clothing items, which is more effective for showcasing fashion items than photos alone. The addition of customer reviews is a smart move, and M&S also provides the ‘was this review helpful?’ option to make it easier to organise product reviews, though the addition of features like pros and cons and picking out keywords, as Kiddicare does, would be one way to improve, especially as these product pages may well attract large numbers of reviews. M&S is beginning to focus more on its multichannel strategy, with the option, on many product pages, of collecting items in store. I’ve written about this lately, with reference to both Halfords and Argos, and it is a tactic that can work well in terms of driving offline sales. It has been said that, for every sale the web generates online, it pushes three in store, so it makes perfect sense to make it easy for customers to search online and buy offline. At the moment, the M&S Shop Your Way service is relatively limited, as it only applies to 46 of its stores, as well as a limited range of products, though the retailer plans to extend the service to 163 locations this later this month. Also, whereas Halfords allows customers to enter a postcode or town name to check stock in their local area direct from the product pages, M&S shoppers have to consult a pop-up list to see if they have a local store in the scheme, then wait until they are at the delivery details stage of the checkout process before they can select a local store and find out about stock levels. Collect in store services are a great idea, but it is about making it easier for customers to research and buy offline, and M&S could make its process a little smoother. Another thing I noticed on the product pages is more prominently positioned product codes, though I’m not sure whether this is to make it easier for customers to find products from catalogues and leaflets or for telephone orders. The shopping basket page is clear and easy to edit, while it ticks most best practice boxes in terms of delivery and payment options, as well as a nice clear call to action. The process is clear any easy to use, with the stages set out clearly along the top of the page, and with most links and navigational options removed to minimise distractions for shoppers. There are links at the bottom of the page for contact details, returns policies etc, but these open in a new window and therefore customers remain within the payment process. One area which could be improved is registration, as new shoppers are forced to create an account, entering name and email address details. Though there are worse registration forms, it still represents an unnecessary obstacle for shoppers. A better idea would be to make registration voluntary, and have users create an account as part of the payment process, rather than making it compulsory. The relaunched M&S website is definitely an improvement on the previous incarnation, and it gets most of the basics right, in terms of e-commerce best practice. Thanks to widening the site, the overall look and feel is improved, and the customer journey is indeed improved. A few tweaks here and there could still make a difference though, such as making the collect in store option easier, and looking at the issue of registration. Comcast’s version of “TV Everywhere” is going to be rolling out soon, but rather than complete television programming streaming everywhere, it’s starting to look more like “Some TV on a computer. Near your TV.” The company’s CEO announced that their online video service will launch later this year. But it will take awhile for Roberts’ vision of “pay once, consume anywhere” to come to fruition. For starters, Comcast can only authenticate viewers in their own homes at launch. Yell.com has just released a free iPhone app allowing users to search for local businesses in the UK.